, it's now time to gradually say goodbye to the old CSV download scripts for information on queries & rankings. We'll be turning off access to these downloads on October 20, 2015. These download scripts have helped various sites & tools to get information on queries, impressions, clicks, and rankings over the years. However, they didn't use the new Search Analytics data, and relied on the deprecated Client Login API. Farewell, CSV downloads, you've served us (and many webmasters!) well, but it's time to move on. We're already seeing lots of usage with the new API. Are you already doing something neat with the API? Let us know in the comments! With the new Search Analytics API, it's now time to gradually say goodbye to the old CSV download scripts for information on queries & rankings. We'll be turning off access to these downloads on October 20, 2015. Taking your site offline temporarily will prevent your site’s visitors from going to hacked pages and give you time to properly fix your site. If you keep your site online, you run the risk of getting compromised again as you clean up your site. The next few steps require you to be comfortable making technical changes to your site. If you aren’t familiar or comfortable enough with your site to make these changes, it might be best to consult with or hire someone who is. However, reading through these steps will still be helpful. Before you start fixing your site, we advise that you back up your site. (This backed up version will still contain hacked content and should only be used if you accidentally remove a critical file.) If you’re unsure how to back up your site, ask your hosting provider for assistance or consult your content management system (CMS) documentation. As you work through the steps, any time you remove a file, make sure to keep a copy of the file as well. In order to manipulate your site, this type of hack creates or alters the contents of your .htaccess file. If you’re not sure where to find your .htaccess file, consult your server or CMS documentation. Also, check your site for any recently modified files. Template files that have been modified recently should be thoroughly investigated. 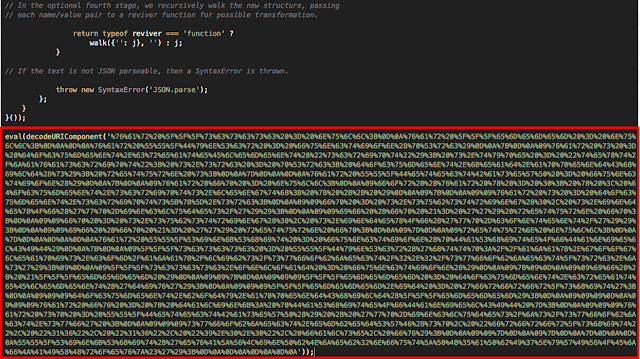 Tools that can help you interpret obfuscated PHP files can be found in the Appendix. As mentioned previously, back up the contents of your site appropriately before you remove or alter any files. If you regularly make backups for your site, cleaning up your site might be as easy as restoring a clean backed-up version. Once you’ve removed the malicious file, you’ll want to track down and fix the vulnerability that allowed your site to be compromised, or you risk your site being hacked again. The vulnerability could be anything from a stolen password to outdated web software. Consult Google Webmaster Hacked Help for ways to identify and fix the vulnerability. If you’re unable to figure out how your site was compromised, you should change your passwords for all your login credentials,update all your web software, and seriously consider getting more help to make sure everything is ok.
Bring your site back online as soon as you’re sure your site is clean and the vulnerability has been fixed. If there was a manual action on your site, you’ll want to file a reconsideration request in Search Console. Also, think about ways to protect your site from future attacks. You can read more about how to secure your site from future attacks in the Google Hacked Webmaster Help Center. 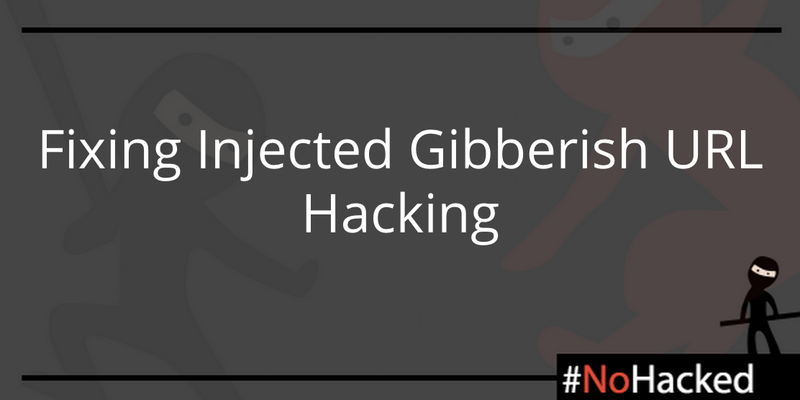 We hope this post has helped you gain a better understanding of how to fix your site from the injected gibberish URL hack. Be sure to follow our social campaigns and share any tips or tricks you might have about staying safe on the web with the #nohacked hashtag. If you have any additional questions, you can post in the Webmaster Help Forums where a community of webmasters can help answer your questions. You can also join our Hangout on Air about Security on August 26. These are tools that may be useful. Google doesn't run or support them. PHP Decoder, UnPHP: Hackers will often distort PHP files to make them harder to read. Use these tools to clean up the PHP files so you understand better what the PHP file is doing. This hack often uses cloaking to avoid webmasters from detecting it. Cloaking refers to the practice of presenting different content or URLs to webmasters, visitors, and search engines. For example, the webmaster of the site might be shown an empty or HTTP 404 page which would lead the webmaster to believe the hack is no longer present. However, users who visit the page from search results will still be redirected to spammy pages, and search engines that crawl the site will still be presented with gibberish content. Properly monitoring your site for hacking allows you to remedy the hack more quickly and minimize damage the hack might cause. There are several ways you can monitor your site for this particular hack. Because this hack creates many keyword heavy URLs that are crawled by search engines, check to see if there was any recent, unexpected surges in traffic. If you do see a surge, use the Search Analytics tool in Search Console to investigate whether or not hacked pages are the source of the unusual website traffic. Periodically checking how your site appears in search results is good practice for all webmasters. It also allows you to spot symptoms of hacking. You can check your site in Google by using the site: operator on your site (i.e. search for site:example.com). If you see any gibberish links associated with your site or a label that says “This site may be hacked.”, your site might have been compromised. We recommend you sign up for Search Console. In Search Console, you can check if Google has detected any hacked pages on your site by looking in the Manual Actions Viewer or Security Issues report. Search Console will also message you if Google has detected any hacked pages on your site. Also, we recommend you set up Google Alerts for your site. Google Alerts will email you if Google finds new results for a search query. For example, you can set up a Google Alert for your site in conjunction with common spammy terms like [site:example.com cheap software]. If you receive an email that Google has returned a new query for that term, you should immediately check what pages on your site are triggering that alert. In Search Console, you have access to the Fetch as Google tool in Search Console. The Fetch as Google tool allows you to see a page as Google sees it. This will help you to identify cloaked hacked pages. Additional tools from others, both paid and free, are listed in the appendix to this post. If you’re not sure if there is hacked content on your site, the Google Hacked Troubleshooter can walk you through some basic checks. For this type of hack, you’ll want to perform a site: search on your site. Look for suspicious pages and URLs loaded with strange keywords in the search results. If you have a large number of pages on your site, you might need to try a more targeted query. Find common spam terms and append them to your site: search query like [site:example.com cheap software]. Try this with several spammy terms to see if any results show up. Because this type of hacking employs cloaking to prevent accurate detection, it’s very important that you use the Fetch as Google tool in Search Console to check the spammy pages you found in the previous step. Remember, cloaked pages can show you an HTTP 404 page that tricks you into thinking the hack is fixed even if the page is still live. You should also use Fetch as Google on your homepage as well. This type of hack often adds text or links to the homepage. 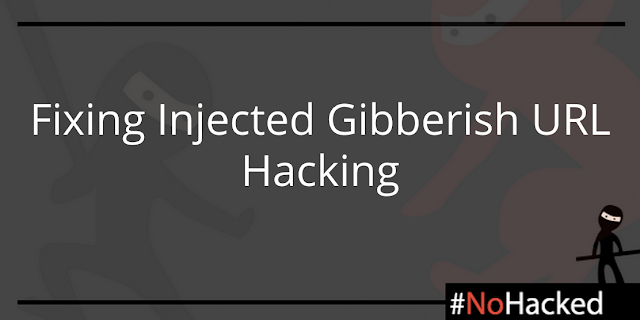 We hope this post has given you a better idea of how to identify and diagnose hacks that inject gibberish URLs on your site. Tune in next week where we’ll be explaining how to remove this hack from your site. Be sure to follow our social campaigns and share any tips or tricks you might have about staying safe on the web with the #NoHacked hashtag. These are tools that scan your site and may be able to find problematic content. Other than VirusTotal, Google doesn't run or support them. Virus Total, Aw-snap.info, Sucuri Site Check, Wepawet: These are tools that may be able to scan your site for problematic content. Keep in mind that these scanners can’t guarantee that they will identify every type of problematic content. There was once a time when having a relatively strong password or answering a security question was a reasonable way to protect your online accounts. However, according to a study from Stop Badware, stolen credentials is a common way for hackers to compromise websites. Additionally, even reputable sites can fall victim to hacking, potentially exposing your personal data like passwords to attackers. Fortunately, two-factor authentication can help you keep your accounts safer. Two-factor authentication relies on an additional source of verification, in conjunction with your password, to access your account. You might have used two-factor authentication before if you have ever been prompted for a code from your phone when logging into a social media site or from a chip card reader when logging into a bank account. Two-factor authentication makes it more difficult for someone to log into your account even if they have stolen your password. As a website owner, you should enable two-factor authentication on your accounts where possible. A compromised account can cause you to lose important personal data and valuable reputation for your site. Two-factor authentication can give you the ease of mind that your accounts and data are safer. Google currently offers 2-Step Verification for all of its accounts, including accounts from Google Apps domains. You can use your phone, a hardware token like a Security Key, or the Google Authenticator app to verify your account. These options give you flexibility when traveling or when you don’t have access to the mobile network. If your hosting provider, Content Management System (CMS), or any type of platform you use for managing your site doesn’t offer two-factor authentication, ask their customer support for an option to use two-factor authentication in the future.They can build two-factor authentication into their own platforms using Google’s open source code. If your platform or hoster doesn’t provide strong protection against unauthorized access consider hosting your content elsewhere. You can see a list of websites that support two-factor authentication, including what types of authentication options they offer, at https://twofactorauth.org/. If you’ve spent some time on the web, you have more than likely encountered some form of social engineering. Social engineering attempts to extract confidential information from you by manipulating or tricking you in some way. You might be familiar with phishing, one of the most common forms of social engineering. Phishing sites and emails mimic legitimate sites and trick you into entering confidential information like your username and password into these sites. A recent study from Google found that some phishing sites can trick victims 45% of the time! Once a phishing site has your information, the information will either be sold or be used to manipulate your accounts. the owners will either sell it or use it to manipulate your accounts. As a site owner, phishing isn’t the only form of social engineering that you need to watch out for. One other form of social engineering comes from the software and tools used on your site. If you download or use any Content Management System (CMS), plug-ins, or add-ons, make sure that they come from reputable sources like directly from the developer’s site. Software from non-reputable sites can contain malicious exploits that allow hackers to gain access to your site. For example, Webmaster Wanda was recently hired by Brandon’s Pet Palace to help create a site. After sketching some designs, Wanda starts compiling the software she needs to build the site. However, she finds out that Photo Frame Beautifier, one of her favorite plug-ins, has been taken off the official CMS plug-in site and that the developer has decided to stop supporting the plug-in. She does a quick search and finds a site that offers an archive of old plug-ins. She downloads the plug-in and uses it to finish the site. Two months later, a notification in Search Console notifies Wanda that her client’s site has been hacked. She quickly scrambles to fix the hacked content and finds the source of the compromise. It turns out the Photo Frame Beautifier plug-in was modified by a third party to allow malicious parties to access the site. She removed the plug-in, fixed the hacked content, secured her site from future attacks, and filed a reconsideration request in Search Console. As you can see, an inadvertent oversight by Wanda led to her client's site being compromised. Social engineering is effective because it’s not obvious that there’s something wrong with what you’re doing. 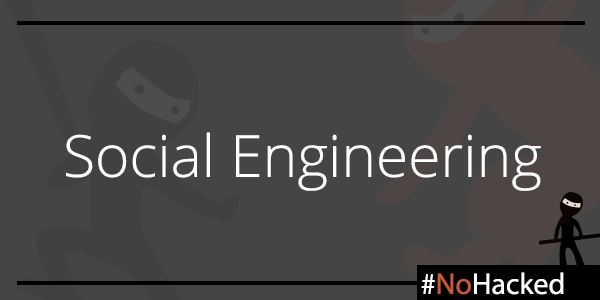 However, there are a few basic things you can do protect yourself from social engineering. Stay vigilant: Whenever you enter confidential information online or install website software, have a healthy dose of skepticism. Check URLs to make sure you’re not typing confidential information into malicious sites. When installing website software make sure the software is coming from known, reputable sources like the developer’s site. Use two-factor authentication: Two-factor authentication like Google’s 2-Step Verification adds another layer of security that helps protect your account even if your password has been stolen. You should use two-factor authentication on all accounts where possible. We’ll be talking more in-depth next week about the benefits of two-factor authentication.